The Somme: The Unseen Panoramas – National Archives Book of the Month! Calling all Western Front visitors! With so much emphasis on the 1 July commemorations on the Somme and the mass pilgrimage that takes place every year, this year please spare a thought for the men who fought in the 1917 Battle of Arras. It was the most savage infantry offensive of the war with the highest daily rate of casualties – over 4,000 men per day. The campaign started with enormous success on Easter Monday, 9 April 1917 with the greatest advance of the war to date but ended in disillusionment and utter exhaustion 39 days later in the fields around Oppy, Roeux, Monchy-le-Preux and Cherisy. Arras is by far my favourite place to visit – there is something about it that I just can’t get enough of and even when driving down to the Somme for a tour, recce or meeting I feel a slight wistfulness as I pass the Vimy Memorial, the grain silos at Roeux, so close to the site of the dreaded Chemical Works and the spire of Monchy church with Monchy British Cemetery in the foreground. I have just received details of the annual commemorative service to be held at the Wellington Quarry, Arras on Saturday 9 April 2011 at 0630hrs (local time). This service, held on the 94th anniversary of the start of battle is held at the Memorial Wall – if you come into the car park from the Beaurains road then you won’t miss it. The ceremony is open to all. Sadly, owing to work and family commitments I will not be able to make it this year but have passed my apologies on to Isabelle Pilarowski and her colleagues. I know that the organisers like to use extracts from soldiers who actually took place in the battle and, having given Isabelle a copy of the 1000 page memoir of Percy Clare, 7th East Surrey Regiment, she has promised that she will be using his superb descriptions of battle during the service. 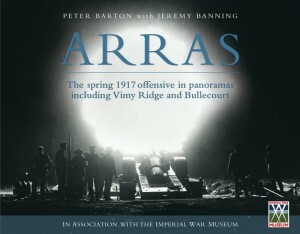 Percy’s memoirs were used extensively in the Arras panorama book – from his descriptions of pre-battle training, through the 9 April attack and subsequent days spent between Arras and the fields below Monchy ending with the fateful 3 May attacks – a very black day for the Third Army. A two-sided pdf file with more details on April’s events is available on request – please contact me here and I will email you a copy. These events include guided walks & tours (French speaking only) in Neuville-St-Vaast, Roeux and Arras itself and seem very good value at just €3.00 per person. I will certainly have the men of the Third Army in my memories on the morning of 9 April and would urge anyone over on a battlefield tour at that time to attend and pay their respects. This entry was posted on Friday, March 11th, 2011 at 3:54 pm	and is filed under Miscellany, News from the front. You can follow any responses to this entry through the RSS 2.0 feed. You can leave a response, or trackback from your own site.